You should all know by now how much I love finding healthy but delicious and convenient snacks...well lets face it; who doesn't love snacking?! 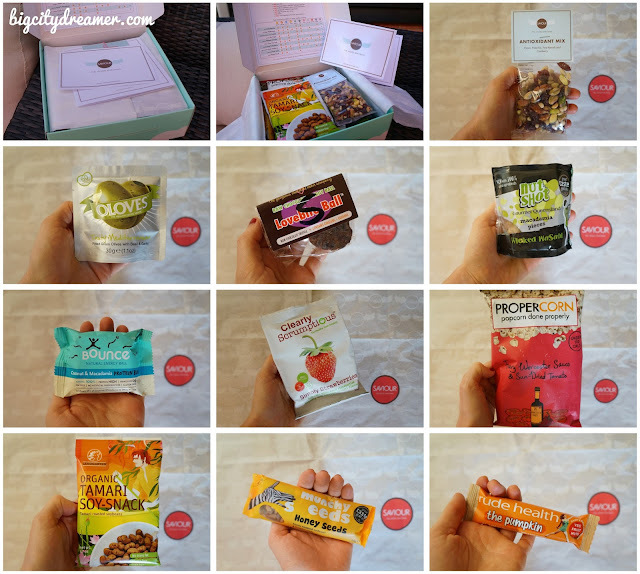 This is why I was delighted to be given the opportunity to try a new online health service that delivers a range of nutritious but healthy snacks straight to your door: Saviour Snacks. Apart from the amazing presentation of the box, the first thing I like about saviour snacks is the great selection and variety. Some of the popular brands (Nakd, Kallo, Bounce) can be found in supermarkets but by getting this box, you can discover new healthy brands and products that are difficult to find elsewhere! The snacks have all been specifically chosen to ensure that they have no trans fat, no hydrogenated fat, no artificial additives, colours or preservatives, no GM and no HFCS. You can eat these products putting your trust in the fact that they are good for you! Another great thing about this service is the fact that the nutritional profile for each snack is presented on the lid of the box. It is easy to find which snacks are suitable for the diets that you follow, whether it be Vegan, Vegetarian, Gluten Free, Wheat Free, Dairy Free or Nut Free, or which snacks will fulfil you craving (sugar, protein, fat, fibre etc). The calories for each product are also presented and more detailed macros can be found on the back of each package (fat, sat. fat, sugar, carbs, protein, fibre and salt). So, to sum that all up, it's very easy to see that what you are eating is healthy and good for your body! As I have already implied, I would definitely recommend trying this service at least once, even if it's just to try new healthy-food brands and products that you wouldn't find elsewhere. The box I received was the Original Saviour box which contains 10 snacks and costs £15 (+p&p). You can also get a gluten-free version of this box or a Super-Size version of the original (which looks amazing! Think of all those healthy snacks)! This box contains 50 products and is a bit more pricy at £75; it does contain breakfast and lunch options too though. All boxes come in a weekly, fortnightly, monthly or one-off subscription and can be ordered through their website: www.savioursnacks.com. Let me know if you are going to try it! I would love to hear what products you got in your box; I will not be content until I have tried every healthy-food product ever made ... I wonder if that would be possible?! And one more thing... are you following me on Instagram yet?? @bigcitydreamerblog :) Leave a comment below and I'll follow you back! Well, I read this article to the end! I love reading your feedback! Healthy Vegan Coconut-Flour Crust Pizza (Gluten-free and Cauliflower-free)!